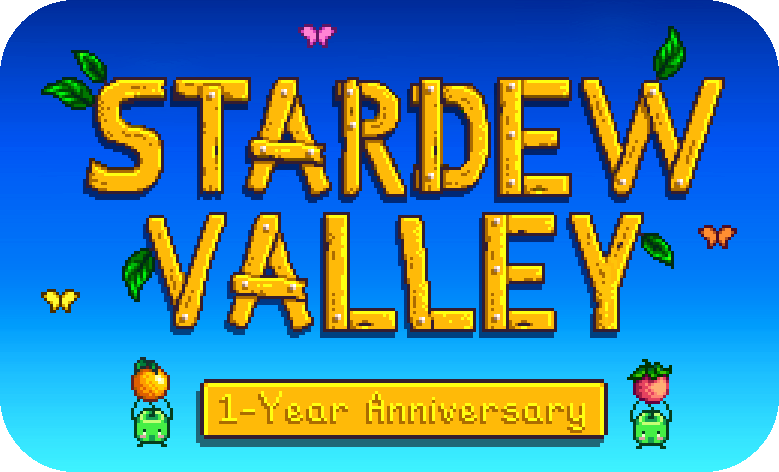 Today marks the 1-year anniversary of the release of Stardew Valley. Considering that I had spent the previous 4-5 years in my own little bubble, working alone, doing essentially the same thing every day… and now suddenly to be thrust into the limelight… it was quite the change! I’m happy about it, of course. I mean… it is a weird feeling, at first, to have something that once seemed so distant, so impossible… some pipe-dream that you fantasized about in the dead of night… actually come true. It takes some getting used to, and that’s part of what this last year has been for me. But I’m very, very grateful to have this opportunity. I’m excited about the future. I have many ideas, and I want to keep making games for a long time to come. 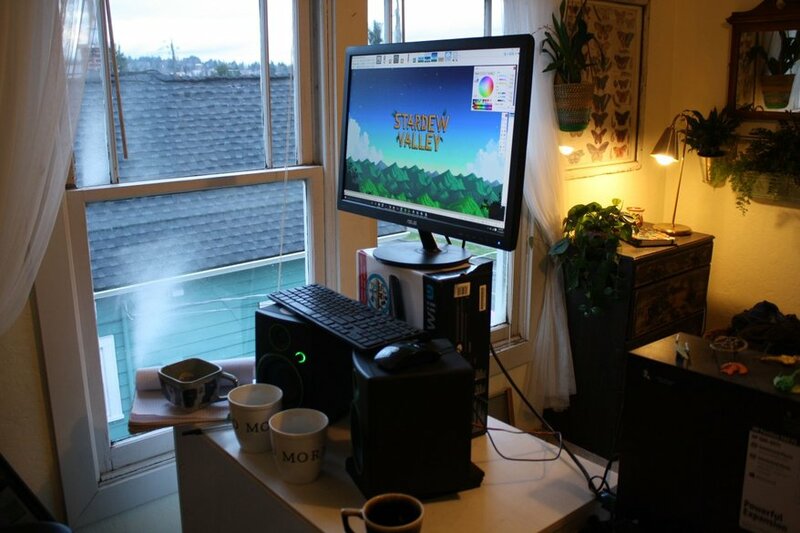 I’ve learned so much from Stardew Valley… the importance of beta testing, how to make decent pixel art, how to use Steam, how to maintain a game after launch. And I’ve made plenty of mistakes, too. But I try to view any blunders in a positive light… fertile ground from which to improve and grow stronger. I’m proud of Stardew Valley. I think it’s a good game. Is it perfect? No. Is it the best I can do? No… really I see this as just the beginning… I’m just dipping my toe into the water. And I’m looking forward to making the next step. I figure this might be a good opportunity to share some development history with you guys. Inventory menu. There were several background themes you could choose from. As you can see, the “bones” of Stardew Valley were pretty much there way back in 2012. So why did it take 4 more years to complete? Well, you could say I was “polishing” the game during those 4 years. I ended up re-doing nearly all the art several times. I redid the vast majority of the soundtrack. I expanded the NPC’s way beyond anything you’d see in the 2012 version. I made the map way bigger and more detailed. I added JojaMart and the Community Center. I added tons of items. I totally changed the crafting system and the mines. It sounded cool, but it was too difficult to make it work well. I spent a lot of time on it, and had a system working. But for some reason it just wasn’t fun. It didn’t feel right… so I scrapped it entirely. I drew every single NPC with 4 different expressions, scanned them in, colored them… and then scrapped all of it. Then I went through probably 6 or 7 iterations of pixel art portraits before landing on the final ones. Stardew Valley was kind of like a big practice project, and I just stuck with it until all my skills improved to a point I was happy with. That was it… no Joja Mart or Community Center, and the blacksmith shop and museum weren’t off in the corner like they are now. The buildings were also a lot uglier. Some day I might do a live stream of an old build of Stardew Valley… that might be fun. Anyway, even back in 2012… when the game looked awful… there were people following it and encouraging me to continue. I appreciate that. To all of you who are reading this, who have played Stardew Valley and built an amazing community around it… thank you so much. The mods, the wiki, the encouraging messages, the fan art… I love it, and I’m so grateful and thankful for your support! I will continue to work hard and do my best to create memorable gaming experiences for you all, through Stardew Valley and whatever comes next! In case you missed it, we’ve been working with Playism to translate Stardew Valley into German, Spanish, Brazilian-Portuguese, Russian, Japanese and Simplified Chinese. Many of you have been waiting super patiently for the localization update to be released, and we thank you for that! Everyone involved in this project wanted to take the time to ensure the patch was stable and the localization was excellent. We’re nearly ready to release the update, but first we’d really love some feedback – is the translation good? Are you running into any new bugs we failed to catch? To that end, we’re running an open beta of the localization update on Steam. The “exit to title” button has returned! From your Steam library, right-click ‘Stardew Valley’ and select ‘Properties’. Choose the ‘beta’ tab. You should see a drop down menu. From there, select ‘beta – Help test new updates before they go live’. It is important to back up your saves. Old saves should continue to work in the beta branch, but make a backup (info about locating your save file) before switching to the beta. After saving in the beta branch, you won’t be able to load your save file in the current stable version. You can reply to this forum thread with feedback, or email [email protected] Thank you for participating! This is a whole ‘nother thing unrelated to localization, but everyone’s been asking us about the multiplayer update. All we can say is that we’re working on it and making progress. It’s not ready yet, though, and we can’t give you an idea of when it will be. We’ll let you know more as soon as we can. Sorry for making you wait! Chucklefish and Sickhead Games are making good progress on addressing some issues with the console versions. Their top priority is to resolve the issue where saved games become unload-able. Fortunately, they’ve discovered the reason this is happening, and after this next patch, it shouldn’t occur anymore. If you currently have a save file that won’t load, it will likely work once again after the patch comes out. The patch will also fix several other issues: I’ll share the full patch notes with you when the it’s been finalized. Most saves that couldn’t be loaded before should now load. In some cases there may be lingering minor graphical issues in save files that previously couldn’t be loaded. Will issues affecting corrupted Xbox saves persist even after the Feb 1 patch? New saves and saves that have previously not been corrupted will work fine and will never become corrupt. Existing saves that became corrupt and could not be loaded will be repaired and become loadable in almost all cases now. Saves that became corrupted may continue to behave oddly in some cases (Refer to the list in Xbox One patch notes about issues that might persist). What about the issue where PS4 Pro users have problems shutting down their console, going into rest mode and running other apps? I’m pleased to announce the official release dates for the Xbox One and Playstation 4 versions of Stardew Valley! Stardew Valley will launch in North America for the PS4 on December 13th, 2016. Stardew Valley will launch in Europe for the PS4 and globally for the Xbox One on December 14th, 2016. Pre-orders for the Xbox One (globally) and PS4 (Europe only) will begin on November 30th, 2016. Stardew Valley will not be coming to the Wii U, however. Looking at Wii U and the current gaming landscape, we made the difficult choice to shift our development efforts to creating a version for Nintendo Switch. 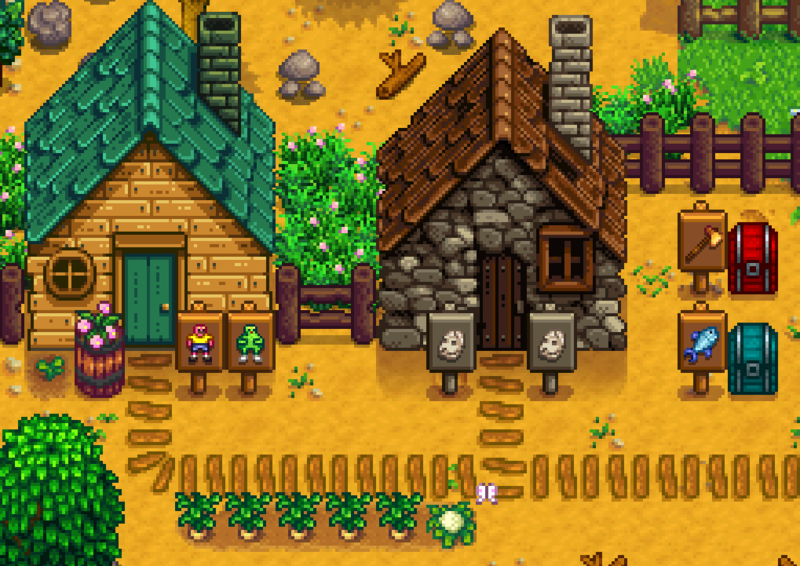 I am really looking forward to the Switch, and I believe that the Switch’s unique capabilities could create some exciting opportunities for Stardew Valley. I do want to emphasize that I am absolutely committed to seeing Stardew Valley on Nintendo platforms, and I really do appreciate your support and understanding in this. As you may know, I’ve been working with Playism and Chucklefish to create official translations for Japanese, Chinese, Russian, Brazillian Portuguese, Spanish and German (and possibly Thai). I mentioned on twitter recently that these versions would be available some time this month in a free update. However, during our internal testing of the localized versions, we’ve encountered some issues, and it looks like we won’t be able to release it this month. Making sure that everyone has a great experience with Stardew Valley is our top priority, and we all agreed that we’d rather delay the release of the localization update than risk jeopardizing that experience. This is going to affect the localization of the console versions of Stardew Valley more than the PC version. On PC, I can release the localization update as soon as we feel like it’s ready. Releasing a game on consoles is more complex and requires submissions well in advance of the actual release. This means the console versions will only be in English at launch, and we’ll have to patch in the other languages a little later. Multiplayer is still under development… I know it’s taking a while, but it should be worth the wait. Thanks for your patience!